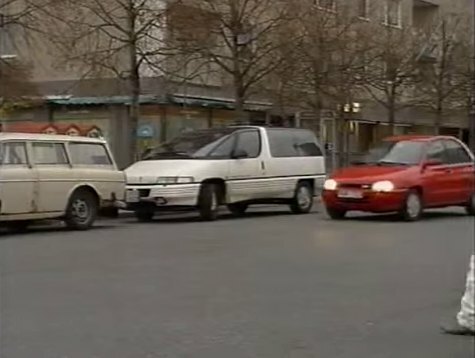 IMCDb.org: Pontiac Trans Sport in "Tre kronor, 1994-1999"
Could this be made for Sweden due to the headlights washer? On the other hand, the plate holder isn't exactly EU-sized... This could be a US import with the washers fitted on to comply with local rules. It was a game when it comes to GM vehicles in Europe. Basically all GM brands going into the 2000s (not sure if they still do it) sold their lineup in one of two ways: EU spec, which was amber lights, built in repeaters, and proper plate holders or what I call the "cobble spec", which was a version that basically was a USA spec car with EU-spec instruments installed later. This looks to be one of the latter, because the vehicle has headlight washers, but US-sized license plate holders and no repeaters. A plan jane USA model wouldn't have a headlight washer. The Trans Sport was sold in this USA modded version and its more well known EU version, which was basically the Oldsmobile Silhouette with repeaters stuck on the fenders. So it's still Made for S.